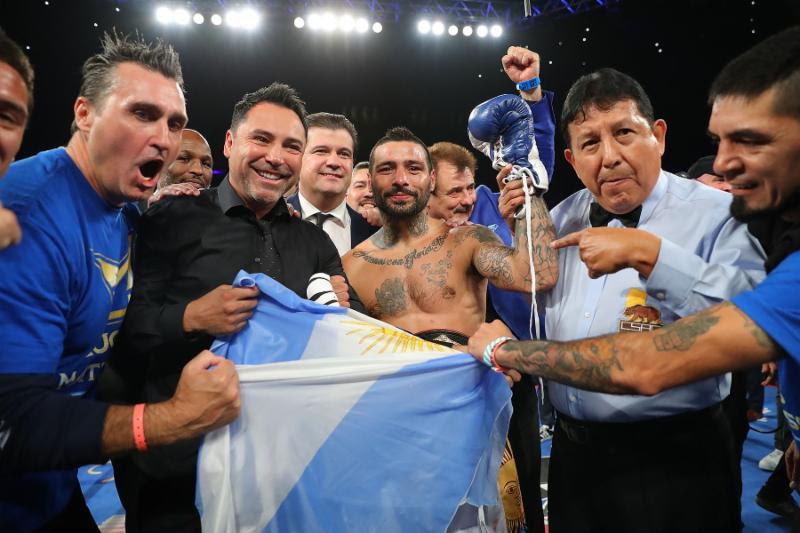 WBA “regular” welterweight champion Lucas “La Maquina” Matthysse 39-4 (36) is confident he has the tools to deal with challenger Manny “Pac-Man” Pacquiao 59-7-2 (38) when the two meet at Axiata Arena in Kuala Lumpur, Malaysia on July 15 despite two of his four losses coming to left-handers. The Argentine knockout artist has spent the last two months in camp in California working out with a range of southpaws to get accustomed to the awkward angles that left-handers use in their attack and defence. Coach Joel Diaz drafted in a number of southpaw sparring partners for the camp, even relying on left-handed members of Matthysse’s own family to assist with aspect of training. “We’ve been focused on the southpaw stance, even giving him southpaw sparring partners. Myself and Matthysse’s brother-in-law Mario Narvaez are both southpaws and we’ve been hitting the mitts against him ahead of this fight against Pacquiao,” he said. Two of Matthysse’s four professional losses have come against southpaws. In 2010 he lost a 12-round split decision to former undisputed welterweight champion Zab Judah, while the following year he dropped a split decision to former unified junior welterweight champion Devon Alexander. The loss to Alexander still sticks in his craw. “I feel I did not lose that fight,” Matthysse said. It’s not all bad news for Matthysse, though. In 2011 and 2012 respectively he scored knockout wins over southpaws Demarcus Corley and Ajose Olusegun. The first challenge for Matthysse and his team will be adjusting to the time difference and shaking off the jetlag that comes from such a lengthy flight. The fight will be Pacquiao’s first since losing his WBO welterweight title to Australian Jeff Horn 18-1-1 (12) in front of 51,000 fans at Brisbane’s Suncorp Stadium last July. It was Pacquiao’s fourth loss is his last nine bouts but Matthysse insists he won’t be taking the former eight-division world champion lightly. “He fought his level best during those four defeats so let’s not underestimate him,” he said. Matthysse was last in action in January when he picked up the vacant WBA “regular” title by KO8 against Thai fighter Tewa Kiram 38-1 (28) in his first world title fight at welterweight since moving up a weight class the previous May. With a busy media schedule ahead Diaz warned the press that they would have to give the champion time to get to the gym and workout as his seeks to adjust to the conditions and time difference over the next 10 days. “The media is going to have to give us time to train. Even if they don’t, we are still going to have to find a way,” he said.